Romanesco, also known as the Roman cauliflower is actually half cauliflower, half broccoli. It looks almost alien with its strange structure and lime green fractal florets. But don’t be put off, it’s one of the tastiest brassicas out there and is perfect for an all Italian late autumn or winter meal. I was inspired by the delicious roasted romanesco at River Cottage a few weeks back and have been experimenting at home with frying it rather than roasting. Its inherent nuttiness is enhanced when fried or roasted. It also has an affinity with garlic, lemon, chilli and almonds. So for this romanesco pasta dish I used all four. Luckily I didn’t have to go to Italy for the romanesco as we grow plenty of them here in Cornwall. It’s always nice to enjoy local produce where possible. Barilla is Italy’s top selling pasta brand. It uses only top quality durum wheat and water. Oh, and some Italian passion apparently! I was sent a selection of their pasta and sauces to try. For this recipe I went with the wholewheat fusilli; I prefer to eat wholefoods when given the choice. I also like the fun twisty shape and find it holds a tomato sauce very well. The ingredients are %100 whole durum wheat semolina and water – talk about elegant simplicity. Barilla also make a fantastic Arrabbiata sauce, or what I’d call tomato & chilli sauce. It contains only natural ingredients, is rich and flavoursome with just enough chilli to make its presence felt. Italians are not hot headed, or at least when it comes to chillies. The romanesco is first steamed, then fried with lemon and garlic. This tops the pasta and tomato sauce. My easy romanesco pasta is then finished with toasted flaked almonds to make a delicious dish fit for anyone, including vegans. The flaked almonds could, of course, be swapped for some grated Parmesan cheese. The fusilli pasta was one of the best I’ve tried. I’ve noticed some of the brands go a bit mushy on the outside whilst the inside isn’t quite cooked. The sauce had a good consistency and excellent flavour and the whole dish was truly scrumptious. CT kept telling me just how delicious it was – he’s not generally one for going into raptures. This quick & easy weekday meal is served with tomato chilli sauce and romanesco with lemon & garlic to make it a bit more special. Sprinkle toasted almonds over the top instead of cheese for an all inclusive vegan bowl of goodness. Trim the romanesco of outer leaves and tough stalk. Place in a medium sized pan with a couple of centimetres of boiling water and the pinch of salt. Cover and simmer for about 5 minutes or until the romanesco is just tender. Dry fry the almonds over a moderate heat, stirring occasionally until golden. Remove the romanesco into a colander and allow to drain, then pull apart into florets . Cook the pasta in salted boiling water for 11 minutes or until al dante. Meanwhile warm the sauce gently in a pan, stirring occasionally until near simmering. Heat the oil on a non-stick frying pan. Add the romanesco florets and fry over a moderate heat, stirring occasionally, for 3-5 minutes - the florets should be just beginning to char. Grate in the lemon zest and add the garlic after the first 2 minutes. Turn off the heat, squeeze in the lemon juice and stir. Divide the pasta into 2 bowls. Spoon the sauce over the top, then add the romanesco and finish with the almonds. Double the quantities for 4 people. If you're really hungry, allow 100g pasta per person instead of 85g. For more pasta inspiration, head over to my pasta pleasure board on Pinterest. You’ll be surprised at just how many different dishes you can make with pasta. I’m sending my romanesco pasta to Jac at Tinned Tomatoes for this week’s Meat Free Monday. It also goes to Katie over at Feeding Boys for Simple and in Season. Likewise I’m sending my romanesco pasta off to Sneaky Veg and Hijacked by Twins for #CookBlogShare. And lastly, I think! It goes to A Mummy Too for #recipeoftheweek. Thanks for visiting Tin and Thyme. 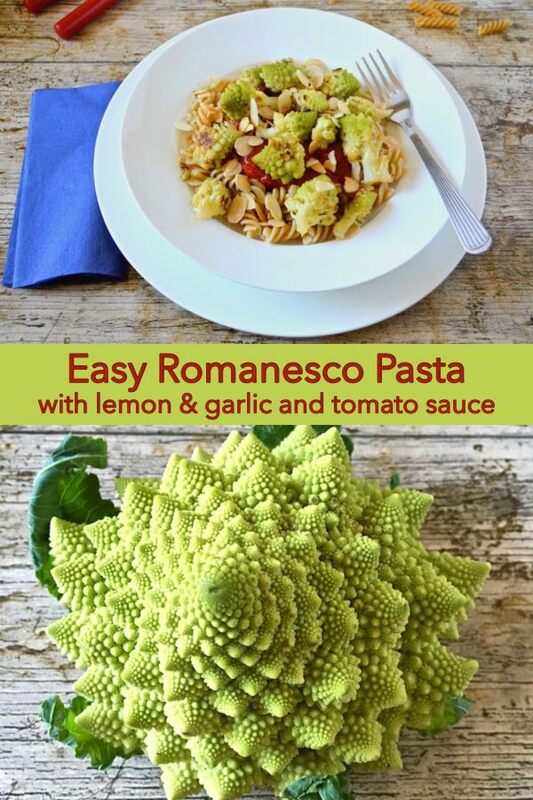 If you make this easy romanesco pasta, I’d love to hear about it in the comments below or via social media. Do share photos on social media too and use the hashtag #tinandthyme, so I can spot them. For more delicious and nutritious recipes, follow me on Twitter, Facebook, Instagram or Pinterest. Post commissioned by Barilla. I was not expected to write a positive review and all opinions are, as always, my own. Thanks to my readers for supporting the brands that help to keep Tin and Thyme blithe and blogging. Oh Choclette, that looks just stunning! There is something so magical about Romanesco cauli’s, they have to be one of the most beautiful veggies around. Thanks Janie – love it when you like my pics 😀 Yes, it’s a fantastic looking veg and it tastes so good too. I think it’s one of those vegetables that takes a bit of getting used to, but it’s definitely worth the effort. A delightful meal! I would love some for my lunch, Choclette. Thank you Angie. It’s so very easy to make and sure beats pasta with just tomato sauce. O yes! I love it! It has that subtle sweetness to it but still acts like cauliflower! It’s a great veg Rebecca, but still so little known. Thanks Johanna. I’d never quite known how to either until I had it at River Cottage and I loved the way they served it. This is my kind of meal, love the combo of ingredients. Beautiful presentation!! Thanks very much cheri. It makes for a most delicious meal with very little effort. I adore romanesco – not just for its taste but because it is such an awesome example of the Fibonacci spiral. Oh, and it’s super-pretty too… it’s almost a shame to cook and eat it, really! That said, your pasta does look exceedingly yummy, especially with the addition of the lemon. Not sure about that one clove of garlic though…. isn’t one clove what you use to flavour other garlic? LOL! Romanesco is so delicious and it adds a little ‘je ne sais quoi’ to your pasta. Love Barilla. That’s the brand my mum has always bought and it reminds me of my childhood in France! Absolutely Mel. This was a first for me, trying Barilla, and I’m sold. I don’t use romanesco often enough, I need to use it more as it’s so delicious. Love this tasty looking recipe. Thanks Sus. It’s really only something I’ve recently started buying on a regular basis – I love it! It sounds delicious and made me realise I have actually never eaten a romanesco! I think that’s certainly something I need to correct soon! Romanesco is so gorgeous – I almost don’t want to eat it! However, I’d be tempted by your pasta dish as it looks absolutely divine. Thanks for joining in with #CookBlogShare this week. I love Romanesco, it looks so interesting, this was the reason why I tried it for the first time. Your pasta dish is looking great, very inviting. Thanks Eb. It’s true, I’m not sure I’ve ever seen a recipe for it. Thanks Becca. Romanesco is delicious and so easy to cook. This recipe looks divine! I have added it to my favorite “Vegetarian Recipes” board on Pinterest! Thanks so much for sharing this lovely pasta dish. I can’t wait to make it at home! Thanks Alix. it’s really quite a simple pasta dish but preparing the romanesco like this turns it into something quite special. Lemons are such a wonderful fruit and they work well in so many dishes.